The AIM NetworkNews and PoliticsDay to Day Politics: What makes them tick? Day to Day Politics: What makes them tick? I befriended Stuart Whitman around three years ago and we have twice since taken coffee together at the popular Federation Square in Melbourne. We both, I think, while discussing the finer points of life, recognised a common thread of humanity that we both shared. At the time he was working in his own business before taking an opportunity to work for Mark Dreyfus in the Senate. He has now moved onto the Institute for Religion, Politics and Society at the Catholic University. “I’ve spent enough years observing now to work out there are generally two motives for people who go into politics – those who enter politics for “who” they want to be, and those for “what” they want to do. Maybe most politicians are a combination of both but which of those two motives proves the stronger for the individual will often determine the true worth of their time in Parliament and what ultimately separates the field. It must feel like an incredible privilege to sit in a state or federal legislature, and an even rarer one to become a minister in a government. But it’s all so fleeting. Not everyone gets a safe seat. Some people sacrifice years and perhaps decades of their lives reaching for that opportunity – giving up family time, attending meetings, befriending the “right” people, making compromises, placing themselves under scrutiny, and building a profile and support base – yet most people with that ambition who have made those sacrifices will never win a preselection to become a party endorsed candidate, and many who do become candidates will never win the election, and those that do may only find themselves there a short time in a marginal seat and because of a more volatile electorate. After your parliamentary service has finished most names will be forgotten by the next generation. And those few who make it to the most powerful positions will just be footnotes in history books within a few generations. Taking any vain affirmation in the achievement is pointless. The nature of the system when you are there can soon make you forget why you entered surrounded by flatterers, detractors, gossipers and narcissists. If you are one of those who sit in parliament for what you want to do, every day remind yourself, have some clear goals and just do it. Use the privilege of being in those chambers to make your mark, have your priority goals ready and don’t stop pursuing them, leave society a better place for having been there and know when you’ve achieved what you set out to achieve – don’t overstay your welcome. Make way for the next person who has goals to serve and contribute, and don’t stay so long that the perks corrupt you to a point you take a permanent holiday from your ethics on the public purse.” (Stuart J Whitman). One example of the above is Peter Dutton. What motivates him to do and say the things he does? Is it purely to stir up hatred of those with a darker skin tone for political reasons? What pleasure does he get from his dalliances into sewer politics? Does he really think that the public falls for his lack of compassion because he is tough on asylum seekers and others? Victoria Police describe Dutton’s ‘African gangs’ crime wave claims as ‘absolute garbage’ and back that up with the facts. Dutton says that people are so afraid that they won’t step outside their doors. “Peter Dutton, Minister for Home Affairs, is a disgrace and should be stood down for manufacturing community discontent with the complicity of the Daily Mail. I have no doubt that what Stuart Whitman says is correct but when you look at the current Ministry it’s difficult to imagine any of them being in the “what” they want to do category. I liken Dodo Dutton to the picture of Dorian Gray… he looks like his ethically rancid thoughts. And his satisfaction in stirring the hornet’s nest is that he provides a smoke screen for a policy bereft and incompetent ruling rabble. Loved you not depending on the media and informants with vested interests for collecting your opinion forming facts. I assume you and Stuart did meet Dutton to get the facts upon which to base your truth on his character, purpose and ability. On what criteria do you base your understanding of his set task and your assessment of his sucuss or failure. All media boys and girls seem to love a little tweaking leaving a modicum of truth as a foundation. Kathleen’s ‘complicit’ is the key to political success. Provide a truth, for the tweaking, and the media will follow. The rabbott worked hard to show how to excite the media day after day, gillard did it once with enormous effect and little billy’s mediscare was a success but such sinning against colleagues is rare in labor but pretty constant in the lib/nats. Oh dear, Concetta didn’t get the email ! Concetta, we stopped bagging Beijing when the Bennelong by-election was over. We are now bagging African gangs in Melbourne and anything to do with power in SA and of course Labor governments anywhere. Coming out and saying that china is building roads and bridges that go nowhere the Pacific and buildings with no tenants is so yesterday and it highlights the fact that we have severely cut our own aid to Pacific Island nations (unless of course they let us operate prison camps on their soil). Concetta, please remeber that this is a government of spin, we don’t get involved in matters of policy or foreign affairs. Samoa’s Prime Minister says Cabinet minister Concetta Fierravanti-Wells’ criticism of China’s aid program is “insulting” to Pacific leaders, and has the capacity to “destroy” Australia’s relationship with the region. Dutton wears the traits of an authoritarian like new suit. He seems to thrive on making explicit displays of power. His public speaking record feveals his naked contempt for due process, opposing views, and especially for non Caucasian Australians. I believe he has been appointed way, way above his ability and is masking his weakness with bravado founded on racism, insult and rabble rousing. I suspect Dutton may be attempting to create a situation or situations where he can use his new found powers as Minister for Home Affairs (what an American wankerism!). What is the point of having such an important title when you can’t use it to stand in front of a row of flags while pontificating about the need for security? It’s a bit of a disappointment having to hide away in radio studios and natter with right wing broadcasters. Doesn’t have quite the same showboat opportunities. Melbourne is an obvious thorn in his side after his unsuccessful Border Farce ‘stop and demand proof of status’ failed miserably. All those shiny black uniforms and no opportunity to use them to install fear in the populace. His targeting of the Victorian government has the advantage of seeking revenge for the failure of his first big gig and discrediting the Labor government of that state. An essay by Stuart Whitman (John Lord post) argues for a respectable political ontology, a sentiment I plaintively share. And how I wish the motives of those who engage in politics were as simple as ‘for the public good’ counterpoised by ‘for personal benefit’. Alas politicians, the bishops of today, are complex creatures; Stuart’s assessment that there are merely ‘self seeking’ or ‘public good’ politicians, is a tad thin, because no matter what political motives, none can fulfil their promise to answer all needs, to solve all problems — for personal benefit or for public good are usually mirages or downright mistruths and only partly explain why politicians do what they do. 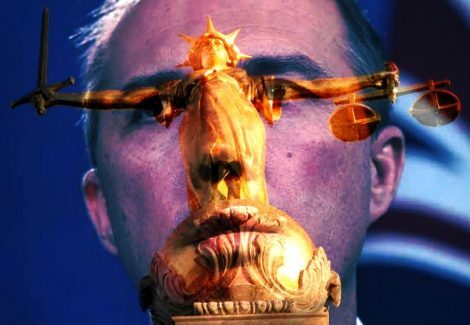 It’s a diversion to analyse Dutton’s personality and then to measure his behaviour by the possessive pronoun — which is to say, Dutton is more than the sum of his personal parts and personal maladaptive behaviours: he represents the prime minister, the cabinet, the government members of parliament … and ultimately, to our shame, the constituency. What he does we are. To know ourselves is to know the likes of Dutton. To understand political motives, as Stuart (all of us) try to do, it is necessary to understand the behaviours of the community as a whole. It’s a tragedy for some, who enter politics with the best of motives, to find themselves mired in the bog of convoluted discourse and power plays and systemic corruption and the slurp of deceits, it’s a tragedy to become so inescapably soiled. I see the Dutton issue as one of ill-propriety which is systemic. To sit in a state or federal legislature or even to become a minister in a government is a fleeting privilege, but if the system is corrupted it is tragic. I imagine I see the tragedy in the clown’s face Turnbull our prime minister presents to the public. He allows what Dutton is. Out politicians must surely know that Australia needs to fundamentally reform its democratic systems of government. I’d like to see this as a premise for argument. I’ve thought and written reams about it and I’m floundering. How d‎‎’you fix the mindset of a community that’s elected a thoroughly rotten, corrupting, incompetent government? Dutton probably sees himself as a modern Heinrich Himmler, granted enormous personal and political power and the ability to act with impunity. I suspect he would also like to build camps to isolate and deal with those troublesome people he doesn’t like or wants to scapegoat. It’s just a matter of using his off-shore detention experience and silencing media dissent. One thing he isn’t is someone who wants to unify and build a tolerant society. I can’t imagine Turnbull seeing him a political asset but then again, perhaps they are closer than I imagine. Support the Getup campaign to target the potato. For turnbull to allow dutton to speech and behave the way he does can only mean that either turnbull agrees with dutton or that turnbull is frightened of dutton. There cannot be any other explanation, because for turnbull it is not the money only the power and prestige of being PM. Clearly turnbull exercises no control (power) over dutton. Lower case names used as a deliberate disrespect. @ Graeme. thanks, will do.